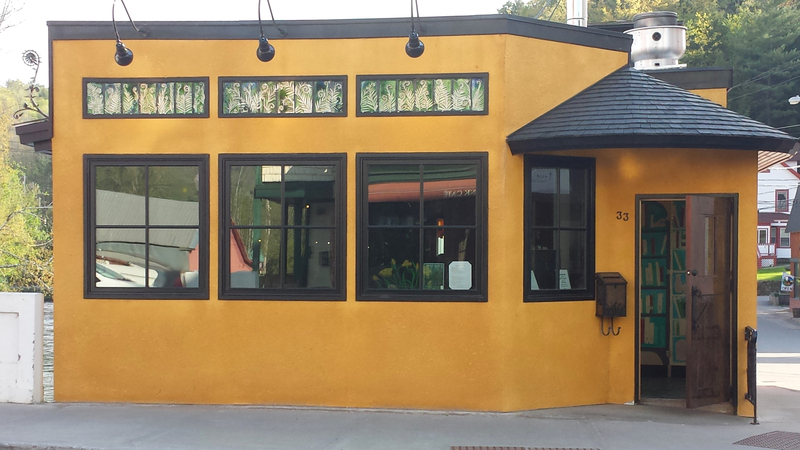 With inlayed tiles of fiddlehead ferns above the windows the only identifying features (and the colorful façade more suggestive of Tuscany than the rustic Adirondacks), you might easily drive by without registering that this was your farm-to-table dining destination in New York’s Adirondack Region, but it would be your loss. 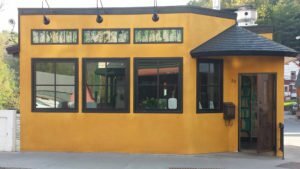 The Fiddlehead Bistro is the latest evidence of the cultural renaissance in the village of Saranac Lake (nine miles west of Lake Placid, 100 miles south of Montreal and 300 miles north of New York City). The bistro was long anticipated in the small, tight-knit community, and its owners Shamim Allen and Craig Bailey have become local heroes for the creative menus (which change daily) that they’ve brought to a small village of just over 5,000 residents. Locals awaited patiently for the bistro’s opening after an extensive renovation of a riverside landmark that took considerable time. (The Fiddlehead Bistro is on the Saranac River, which runs through the village of Saranac Lake.) With custom-made tables engraved with fiddleheads, an antique Vulcan stove as the reception desk, beautiful woodwork and tilework everywhere, and the creativity of local artists displayed throughout, the stage has been set for a fine dining experience, well-worth the wait. Our party of four was greeted warmly, promptly and professionally at the door, ushered to our table on time and without delay. Drinks first, we chose from a creative list of custom cocktails, many ingredients sourced locally. I found the Fiddlehead, concocted from Bison Grass vodka, grappa and chamomile, garnished with a fresh fiddlehead fern and chamomile flowers, a subtle but satisfying alternative to a dry white wine. Three Trees, a blend of tamarind and walnut liqueurs with locally foraged chaga tea was a delightful alternative to an iced tea, its complex flavoring starting with the fruity tartness of the tamarind, followed by the earthiness of the chaga and finishing with chocolate and root beer notes. From a limited beer menu, we chose a respectable Mango Wheat beer from Racquette River Brewing in nearby Tupper Lake. Mid-May in the Adirondacks, locally sourced produce is far from abundant, but there was no shortage of options in the list of appetizers: salad greens, asparagus, shallots, chives, ramps from a mountainside right in the village and, of course, plenty of fiddleheads. The orecchiette, petite ear-shaped pasta in a fruity olive oil with ramps and basil, sprinkled with pine nuts and Dutch Knuckle cheese from Sugar House Creamery in Upper Jay (whose mission is “to revive an Adirondack dairy farm”) was a clear favorite. 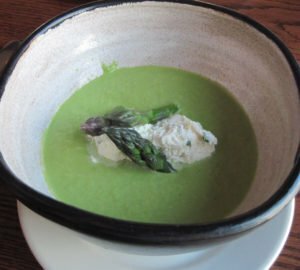 So was the chilled asparagus soup, asparagus from Moonstone Farm and Forest in Saranac Lake, with a refreshingly clean taste, finished with chive-enhanced cream from North Country Creamery, a 100% grassfed, non-GMO and animal welfare approved dairy in Keeseville. There is no season without cheese and we eagerly devoured a cheese plate, with tasty contributions from Sugar House Creamery, North Country Creamery, and Asgaard Farm and Dairy, the cheeses nicely balanced with rhubarb and mustard seed paste, a sliced dried fruit compote and candied pecans. Entrees were international in scope, a favorite being Harissa Pork Carnitas, pork from Kate Mountain Farm, home of the Adirondack Wooly Pig, cooked with a complex sauce of blended peppers, served with cleverly coned flour tortillas, rice and pickled vegetables. Unlike traditional carnitas, the pork was not fried and the chef’s interpretation was much preferred. Appropriate attention was paid to presentation, the steamed fiddleheads beside the moist and tender Airline Chicken (a boneless chicken breast with the drumette attached) on a bed of lemon flavored farro were visually enticing. 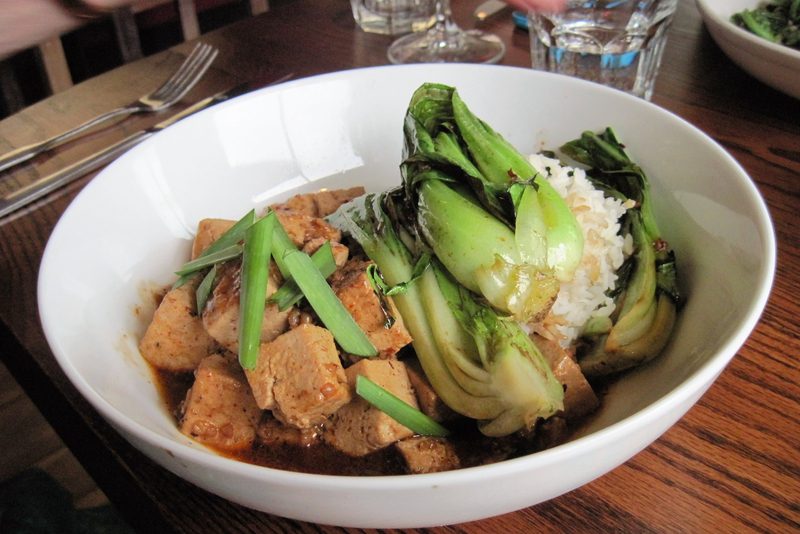 The Fiddlehead Bistro’s mission also includes making sure no vegetarian goes hungry, and the Sichuan mapo tofu, with its spicy and richly flavored chili and bean-based sauce and the accompanying bok choy greens, made for a delicious vegetarian entree for a dining companion. And although it wasn’t on the menu this particular evening when we dined, if the grilled Tofu Steak on a bed of whipped sweet potatoes is available when you do, count yourself very lucky. No meal is complete without dessert in my humble opinion and the hallmark of an excellent and creative restaurant. My favorite was the Lemon and Rosemary Cheesecake, just the right size after a comfortably portioned meal, the cheese nicely textured with a rich chocolate base, topped with a tart, fresh compote of blackberry, pear and balsamic vinegar. The Almond Dacquoise, thin, crisp meringue and almond cookies sandwiched with chocolate buttercream frosting was a close second. We started sampling from the extensive menu at 6 p.m. on a Thursday night in our springtime visit and by 7 p.m., the bistro was full. Though busy, wait staff remained discretely attentive throughout. As evidenced by the frequency of hugs for Shamim from arriving patrons, many of the diners were locals, but with the anticipated reopening this summer of the classic Hotel Saranac after a 35 million dollar renovation, it may not be long before reservations become an acquisition prized by visitors as they discover this new gem of a restaurant.